Everything you need to know!!! Dubai is the land of fun, entertainment and excitement. And nothing better imparts all these than Dubai’s best desert safaris. Dubai city is full of mindblowing skyscrapers, logic defying architecture and modernity that will make you think you’ve stepped into the future. But just beyond the city limits, begins the beautiful golden desert, where the best desert safari in Dubai awaits that will take you back in time the Bedouin lifestyle. The only dilemma you’ll face is which desert safari to choose. There are many choices, each one better than the next. 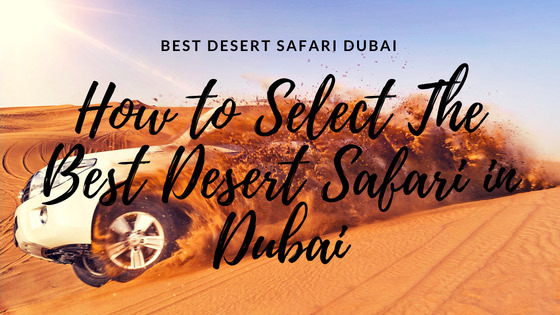 Each has unique features that you’d want to experience and there are also many desert safari deals Dubai will give you to tempt you even more. So, the best way to select is to know about all the best desert safaris, and select the one that appeals to you, your travel companions and your budget. Here’s a look at some awesome desert safaris for you to consider. One of the most popular safaris is the Red Dune Safari. Buty why is it called so? This is because, in this safari, you are taken to the Al Lahbab Desert, where the dunes look like they have been coloured red. The colour gets even more prominent when the sun starts to set. 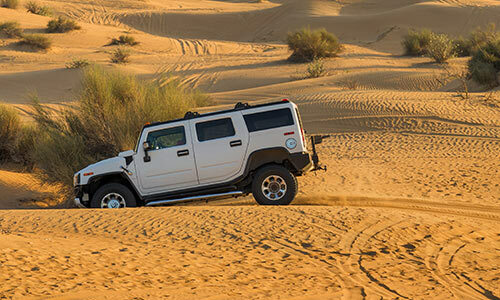 This safari has been carefully crafted will the best features in any desert safari, including the most exciting dune bashing Dubai has to offer. The dunes here are massive and the dune bashing experience is even more exhilarating. There are many times the powerful SUV you are in is flying through the air. You can even add on quad biking and sandboarding on these huge dunes at extra price. Nearing sunset, you get opportunity to stop and take pictures as the stunning colours of the dunes will mesmerize you. Now at the oasis-like desert camp, there are many relaxing activities like falcon photography, Henna painting, shisha smoking, and photo-ops in traditional Arabic clothing. Or you can simply relax by the bonfire and enjoy unlimited refreshments and authentic Arabic coffee and tea. Then, get ready to be entertained by Belly dancers, Tanoura dancers and fire performers. All this while enjoying a scrumptious meal of BBQ vegetarian and non-vegetarian goodies. The night ends with you being transported back to your hotel. So, if you want to see this unique desert, choose the Red Dune Safari. Now this best desert safari is all about style. Instead of the usual 4X4 SUVs, you’ll be picked up from your hotel in the huge, beautiful and luxurious Hummer H2s. This head-turner will take you to the desert for your desert safari. En route, you can see some beautiful plant and wildlife that is exclusive to the desert. Then begins the dune bashing, which is something else when done in a gigantic Hummer H2. You’ll feel like you are indulging in extreme sports. Post this, you can opt for quad biking and take a ride on friendly camels. At the desert camp, you can relax by a bonfire with refreshments, Arabic coffee, tea and shisha. 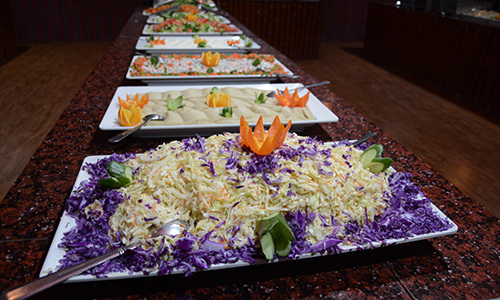 Then enjoy delicious BBQ food, and entertainment by fire dancers, Tanoura dancers and belly dancers. After a wonderful time, you’ll be taken back to your hotel in the same luxurious Hummers, while you enjoy an awesome drive. Therefore, if you’ve always wanted to ride in a Hummer, choose the Hummer Desert Safari. The desert is one of the most beautiful places to see the sunrise from. As the sun comes up slowly, the whole desert is bathed in a glow that makes it look like the city of gold. To enjoy such beauty, you must chose the Sunrise Safari which is one of the best desert safari Dubai has to offer. This safari is short, but quite enjoyable. You’ll be picked early in the morning and taken to the desert before sunrise. Witness this beautiful spectacle and take pictures to cherish them forever. Next, you can indulge in dune bashing and if you’ve selected it, quad biking. 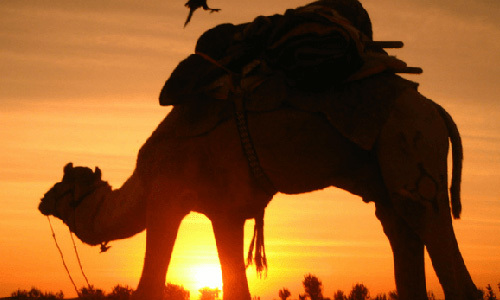 For rest, you are taken to the desert camp for refreshments and you can also take a camel ride. Then it’s time to go back home. This safari lasts only 4 hours and then you’re free to explore more of Dubai. This safari is perfect for people looking to do safari in the morning, and do something else in the evening. For those looking to end the evening in a great way, and enjoy a wonderful atmosphere, choose the Dinner in Desert Safari. You can have a good time in the city, shopping and exploring attractions the whole day, as this safari starts in the evening. You’ll be picked up from your hotel and taken to the desert camp. Along the journey, you can enjoy the sunset, and the beautiful sights and sounds of the desert. Once at the camp, take in the wonderful atmosphere and enjoy activities like falcon shows, camel riding, dressing in traditional Arabic costumes and taking pictures. Ladies must indulge in Henna painting which lasts on your hands for at least a couple of days. Soon it will be time for the delicious dinner. There’s a huge array of BBQ vegetarian and non-vegetarian stuff and also some yummy salads. Enjoy this hearty spread cooked by some of the best traditional cooks in Dubai. There’s also entertainment in the form of Tanoura and Belly dancing. This safari spells for a memorable, and enjoyable evening. Choose this safari, and have the best evening in Dubai. If you think by doing dune bashing Dubai, you have experienced the most exciting activity in Dubai, then you are wrong. There’s another thing you can do that will push the boundaries of excitement. 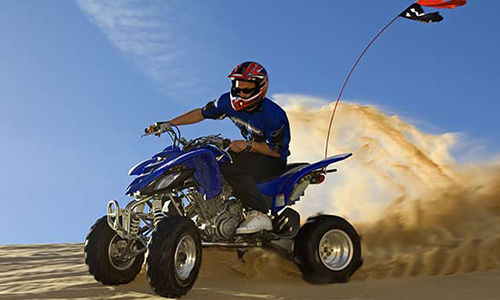 Quad biking is fast gaining popularity among tourists, as this give them a chance to ride on the dunes alone, and in complete control. This best desert safari starts off with a pick-up from your location and transfer to the desert for dune bashing. After this, you get your quad bike. The quad bike in an all-terrain vehicle that rides over any type of area. After getting safety instructions and training, off you go! The quad bikes are great to handle and you can easily maneuver them over the dunes. This whole ride lasts for about 20 mins, which is enough for you to conquer the crazy dunes. Now, you can unwind at the desert camp with refreshments, shisha smoking, traditional dress photography, Henna painting, and more. The tour ends with entertainment by Belly dancers and Tanoura dancers, and BBQ dinner. So, choose this safari if like adventure and fast, quad bikes. 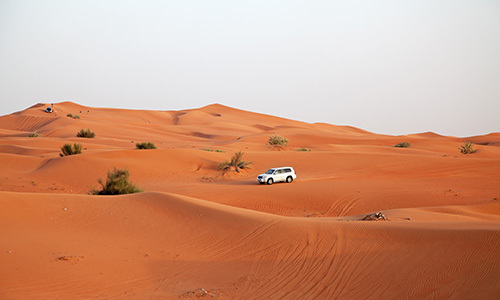 These are some of the best desert safari in Dubai you can choose from. Also, be on the lookout for desert safari deals Dubai has to offer. You can save a lot or even score combo tours. You still have options like Morning Safari, Private Desert Safari, Premium Desert Safari and more. Choose the one that appeals to you the most because honestly, all of them are great. 8 fun places to celebrate birthdays in Dubai!